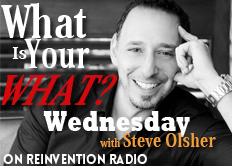 Steve and the Reinvention Radio Crew tackle the question of if your WHAT is something that is altruistic and not income generating, how does one pay the bills and keep food on the table? Is fulfillment alone enough? The conversation then shifts to the question of whether or not we have a personal responsibility to give our gift to others and what happens if one chooses not to.